Makeup for Brown Eyes: The tips and tricks of the trade. Want to wear the most flattering eye makeup for brown eyes? Try these eye makeup looks for casual and dramatic styles. Finding and choosing makeup for brown eyes is a lot simpler than makeup for lighter eyes. You have the chance to play with a variety of colors, shimmers, and darker shades that may be too dark for many other girls. Remember, though, that you should always choose your makeup based on first your hair color, and then your eye color. Your eyes may be a very deep brown, but if you have medium blonde hair dark colors will be too harsh and heavy on your face. If you have lighter hair, it is a good idea to stick with peachy eyeshadows. Gold, apricot, and beige in either a matte or shimmery finish will make your eyes stand out by contrasting the tones. You can also use a bit darker eyeshadow in the crease of your lids for a little added definition without looking overdone. If your hair is dark, you have even more room to experiment. Play with shades of Lavender , violet , sapphire , emerald , chocolate brown , medium neutrals , black , and charcoal are all great makeup for brown eyes especially for your eyeliner or eyeshadow. Your skin tone may only support lighter versions of these color groups, or may look beautiful with a deeper shade. Don't be afraid to wear black or very dark brown mascara to compliment your darker eyes and hair. 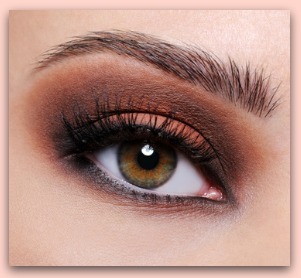 By the way, smokey eyes look wonderful on brown eyed girls, and are a lot easier to pull off than if you are fairer. Wear smokey eyes to parties, on dates, or just an evening out on the town. Along with the good, there are a few colors to avoid wearing as well. Ice blue, white, gray, yellow, and pink do not match up well with brown eyes at all. The right shade of orange can sometimes accent brown eyes well, but if you aren't sure, assume that this is another color to be avoided. Because brown is an earth tone, it looks best when paired with other earth tones and vibrant colors with cool undertones. If you are trying to pick out a lip gloss or lipstick to pair with your dark hair and skin, first try a neutral tone that is a few shades darker than your skin. Clear gloss paired with smokey eyes is also a great way to go for a naturally beautiful look. Reddish lipsticks with brown undertones and a medium amount of eye makeup is also a great look. When you decide to choose a blush, there are a few different ways you can go about it. If you're looking for an evening look, it is best to stay with neutral blush shades that highlight your skin and blend well. Coral is a good color to start with for most medium brunettes. For day-to-day wear, you can definitely get away with wearing a slightly pinker shade, as long as it doesn't contrast with your hair color too much. One way to buy the best blush for your skin is to sample a few neutral and pink eye shadows on your cheeks, and then use the best shade to match up a liquid or powder blush.